We supply/ manufacture EVERYTHING you/your company needs to get noticed and make a lasting 5star impression! Padded and lined for Warmth and Comfort. Great value paded jacket with full zip front side pockets and top stitching throughout. Also including zip-away lining panel for embroidery access. Wind and Water resitant Coated Micro Fiber Fabric, Reversible Styling, Medium weight Padding. Versatile reversible jacket with two zippered side pockets, contrast side panel inserts , short zip cuff and tapered side seams. Embroidery option accessible through zipped collar. Silver coated, Wind and Waterproof Polyester outer fabric, padding and cotton jersey lining. 2 zipped front pocket . Foldaway hood in half moon Collar. Elasticated cuffs. Waist Drawstring with cord stoppers. Inside pocket, inside cell phone pocket. Silver Coated Wind and Waterproof Polyester outer shell with polyester mesh lining and tricot (cotton Jersey) lined Collar. Hidden pockets with zipper hanging loop. Elasticate cuff with adjustable velcro. Elastic drawstring with Cordstopper waist. Zipped access to print/embroidery areas. Parka - This Jacket is clearly in a class above the standard Parka Jacket. BULL strength (330gsm) Cotton Twill outer Shell - Sherpa (artificial) fur Lining - concealed Hood - Features: Heavy duty zipper with storm flap, concealed shock cord & cord locks, two outer double pockets, front jet pockets, velcro adjustable cuffs and zip away lining panel for embroidery access. Faux Shearling - Artificial fur lined Suede - The originals are known as Shearling/Lambskin/Sheepskin - Jackets and Coats. 3/4 Coat - Full Length Coat Imitation Leather - full length - flanel lined - Coat - Windproof - Water resitant - Full Length - Coat - This panel Coat suits most body shapes. The tailored panels give this Coat the ability to enhance body contours. This style is suitable for short.Mini (mid thigh length) Coats, 3/4 (knee lenth) Coats, Midi (mid calf) Coats and Maxi (full length) Coats. The longer length Coats visibly elongate a shaped silhouette. Wind and Waterproof Oxford Nylon outer shell with high quality towelling lining for added comfort. On concealed hood option, the hood folds and zips away. Toggled Drawcord on hood and waist. Ribbed or elasticated Cuffs. Waterproof outer fabric with micro fleece lining for a light weight, warm, versatile and extremely durable Jacket. Features include zippered side pockets, full zip front, inner pocket and shaped side seam. 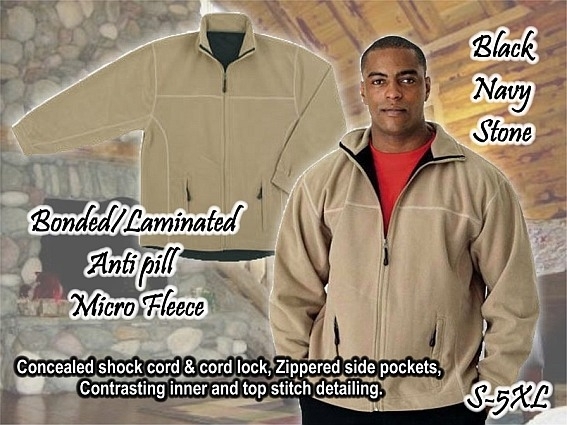 Bonded/Laminated Anti Pill, Lined, Micro Fleece Jackets - Executive Micro Fleece Jacket - Concealed cord & Cord Lock, zippered side pockets, contrasting inner & top stitch detailing. A superbly finished Jacket made to last and retain its Chic and Timeless appearance wash after wash.
Great value, classic, medium weight padding, Sport-Town&Country Jackets. Stylish ladies fit with curved side panels and contrast piping. Zip away lining for embroidery access, two side pockets and adjustable velcro cuff. A Green and Gold Jacket no South African Sports Fan can be without. Wind & Waterproof, padded and lined this is a Jacket for all Seasons. Teamed with matching pants and our Gold ,Green or White Cotton Jersey the Trio is as practical and durable as stunning! Polyamide Outer Fabric. This Jacket features concealed zip off hood, storm flap on front and on pockets. Shock cord with cord lock in hem. Two inner pockets with phone pouch. Double top stitching. Elasticated cuff with adjustable velcro tabs. A long standing favorite with both Adults and Kidz. Wind and Waterproof Airtex lined Windbreaker. Features include a fordaway hood with velcro, side pockets, waistline draw cord and elasticated cuffs. Lined and unlined Polar Fleece Jackets custom made in the colour/colour combination of your choice. Unlined Jackets are available ex stock. An extreme style alternative featuring windproof and water resistant outer fabric. Mesh Airtex lining for added comfort. Zip off hood tucks into collar. Elasticated waist and hem cords with cord locks. Adjustable elasticated cuffs with velcro tabs. Zippered pockets and convenient loose zippered storage pouch. Bomber - Sports or Anorak Style. Wear it as a Jacket on its own or as a Jersey under a Windbreaker or light Jacket for xtra warmth. Polar fleece is durable, warm, easy to care for machine washable and literally dries in minutes. Manufactured from recycled plastic bottles Polar fleece deserves to get an eco friendly rating. Wind and Waterproof Outer Jacket. Polar Fleece Inner Jacket. Outer Jacket features: Chin cover, detachable hood folds into collar, zipped front pockets, zipped chest pocket, 2 inside pockets, reflective sleeve piping, elasticated cuffs with adjustable velcro closure, drawstring with cordstoppers at the bottom. Inner Jacket features: Contrast flatlock stitching, chest pocket. The most practical Children's Clothing items ever! The wind and waterproof Jacket is perfect for Spring, Summer, Autumn & Winter. Partner the Jacket with a polar fleece Jersey for xtra warmth for Winter. Matric, Team & Club Jackets made with material, colour, colour combination and finishes of your choice. Heavy duty Poly Cotton Twill Fabric. This Jacket/Body Warmer/Waistcoat is perfect for anyone who needs plenty of stuff on board at all times. The Jacket has plenty zipped and unzipped pockets. It's extreme durability makes it the perfect key item for any Crew. Embroidered with your Logo this super practical Jacket compliments any pair of Jeans/Trouser and Jersey/Shirt or T Shirt. The Jacket has been designed to suit SA's Weather Conditions. Padded for Winter, lined only for Summer. The green and gold is recognized by Sports fans all over the World as the colour combination of Winners from South Africa. The Logos illustrate where what happens(ed) and when. The Jacket is designed to last and tell the story for many years. Plus custom made Jackets & Windbreakers, Light and Padded Jackets- in the colour / colour combination and material of your choice! Bomber Jackets are roomy across the chest and shoulders and gathered at the waist with ribbing or an elasticated waistband made with the same material as the rest of the Jacket. Bomber Jackets were named after the American air force pilots wore them while flying aircrafts during the Ist World War. Hence the Jackets are also known as Flight Jackets. And because the Jacket is short it is also perfect to sit on a Bike, protecting the Biker and allowing him/her to have unrestricted leg movement. Hence today, the Bomber/Flight Jackets are also known as Biker Jackets. Sports Jackets are loose fitting, straight hip long Jacket with or without a drawcord in the bottom hem. The drawcord enables the wearer to gather the Jacket at the waist or hip. Anoraks - 3/4 Coats - Parkas - are loose fitting - straight - thigh or knee long and hooded. A must when above average protection from wind, cold and rain is required. Capes - are long flowing sleeveless Cloaks which can be made from almost any fabric - Satin for an evening Cape, Coat fabric, Cotton etc. Contrast colour lining gives the Cape a luxurious, eyecatching appearance. Coats - This is a full, ankle length or Maxi Coat. The calf length Coat is a 3/4 or Midi Coat. The knee length Coat is a Car, Mini or short Coat.